Every human being seeks it. Every human being needs it. Privileged people who have opportunities and no restrictions can pursue their personal freedom. Because they live in a free environment, those lucky ones can define what freedom means to them. They can live a dream on their own. The majority of the people, however, are restricted in their freedom by their state which restricts it in many ways. people don’t have the right to marry the person they love. The people of Catalonia who are in favor of the Catalan independence and seek the independence from Spain, are following this saying. The people in Catalonia, in general, live a good life compared to many people on the planet. They kind of live in freedom, however not entirely. Yesterday, 1 000 000 Catalans got together in Barcelona to celebrated La Diada, the National Day of Catalonia. My Catalan friend Will invited me to join him and his father to experience with them my first Diada. The Catalans protested and fought for their right to vote to become independent. Fought is the false word though — they celebrated. I saw a father and his son, arm in arm, cheering, shouting, singing the Catalan anthem, in their eyes happiness, excitement, and joy. I saw families with little kids, which tiny bodies were covered in Catalan flags, all of them forming a big, loud crowd, happy and proud of being together on the streets sharing their beliefs. During one minute the 1 million people kept silent and commemorated the terroristic attack of Barcelona 3 weeks ago, where 13 people were killed at the famous always crowded las Ramblas. The only seconds, in which joy and excitement were muted. After that, the crowd applauded and went on with the celebrations. One could feel, that the people had overcome their fear of terrorism. 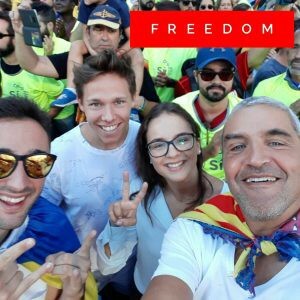 When the official manifestation ended, the crowd moved out of the city center to the Arc de Triomf and continued the celebrations with free open air concerts of Catalan Bands, singing, and dancing, peacefully and lovingly. During the concerts, I talked with several Catalans to gain perspective. The Catalans in favor of the independence want to vote. They want to use their power, a power they should have, living in a democracy. The Spanish State does not allow them to vote. They feel mistreated by the government. Most of the Catalans I talked with, have friends all over Spain. The Catalans in favor of the independence would love to live in a free country called Catalonia, but first and foremost they seek the freedom and their right to decide whatever the outcome may be. I spoke with a lot Catalans before because of my interest in the question of independence. Alongside the Catalans who wish for the independence, there is a big part that is against it. They feel Catalan and are proud Catalans but prefer that Catalonia stays being a part of Spain. Catalonia has its own culture and its own language. Catalan is spoken by 10 million people, in Catalonia, Andorra parts of France, and a city of Sardegna. Italy. In comparison, just around 5,3 people speak Finish. On my own, I experienced the false thinking that Catalan is not an own language and not more than a dialect. I can tell you, studying one year in Barcelona, that Catalonia is not Spain and Catalan is not Spanish. When you speak German, you can get what Dutch people are talking about, but that does not mean that you can speak a word Dutch. The same goes for Catalan and Spanish. When you speak Spanish, you can understand the Catalan people, but you don’t speak Catalan. During my year studying in Barcelona, I had one course in Catalan. That class was meant to teach me, Catalan. I learned some words and fell in love with the language. However, I had to speak most of the time in Spanish with Catalan students. The Catalan people are considered colder than a lot of Spanish people. Maybe that comes because they are from the north of Spain, near to France, nearer to Germany. But I think other Spanish people have that opinion and may have made that experience because they spoke in Spanish with Catalans. Almost every Catalan can speak Spanish and is willing to speak in Spanish. However, if you talk to them in Catalan, or listen them talking in Catalan, you can see an entirely different human being. They speak with soul, love, and fire. They speak in their language, they speak from the bottom of their heart. Catalans want to be seen as what they are, as Catalans. If Spain and Europe would accept the culture more, most of the Catalan would feel more freedom even within a Spanish state. A state that should give them the right to vote for the independence. Because that is just what they want, the right to vote, to see if the majority is in favor or not, they want democracy. At least that is the feeling I got from experiencing and observing Catalans throughout a year and experiencing La Diada today with my Catalan friend Will, his father and his friends. Every human being seeks freedom. Every human being needs freedom. And every human being seeks and needs acceptance and respect. I loved to see a nation seeking freedom their way, protesting without violence, respecting others in their view, explaining their situation, celebrating to be heard. Please accept the Catalan people, the language Catalan, and Catalan culture as something unique, like they accept the whole world as something unique. The Catalans in favor of the independence probably will go on manifesting for years. Catalan people don’t know different. They are proud of their violence free celebration for freedom. Doing so, their feeling of being Catalan is maybe as strong as it can be. Originally published at Jan Stetzka.